Premiered by the composer in St Ouen, 28 April 1895 (Vierne having weeks previously aired a truncated version in Lyon), movements I-III of the basaltic Gothique were written in Persanges in the Jura during the summer of 1894. Overall the tonality scheme spells out the triad and octave of the home key: C minor—E flat major (bel canto inflected middle section in B flat)—G minor (6/8 fugue in four voices, excursioning to E flat minor and G flat major)—tierce de picardie C major (theme and variations). The third and fourth movements are based on pre-Solesmesised Gregorian plainchant—the Introit Puer natus est nobis (fourth Christmas Day Mass, Ad Missam in Die ), admired by Widor for its purity of line and potential for ‘polyphonic development’. Of the six variations comprising the Moderato/Allegro finale, a quasi-passacaglia with origins possibly as early as the spring of 1890 when Widor inaugurated the St Ouen instrument [‘“Magnificat versets”, a fragment composed for the occasion (Symphonie gothique)’]: i) presents the plainchant as a long-note cantus firmus; ii) and v) are canons at the octave at four and two bars’ distance; and vi) is in the style of a virtuoso toccata culminating in a paen of snarling thunder and lofty chorale. The contrapuntal genius of this movement, of the symphony as a whole indeed, takes the high-ground at every turn, baffling some, awing others. ‘What is counterpoint,’ Widor wrote in a feuilleton about the B minor Mass (Piano-Soleil, 27 January 1895), ‘if not the art of writing luminously? It is not filling, trompe-l’oeil, false means, possible tricks; all is displayed in broad daylight, out in the full sun; each note has its value in the whole; each detail, each modulation, each plan must assert itself in its turn, sparkling as the facets of a diamond. 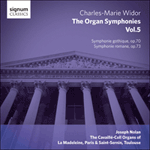 We need, we want, to hear everything.’ The Ninth was Widor’s favourite symphony. At Saint-Sulpice it became customary for him to play the first movement at the Feast of All Saints’ Day (1 November); and the last movement, together with the Allegro cantabile from the Fifth, at Midnight Mass.